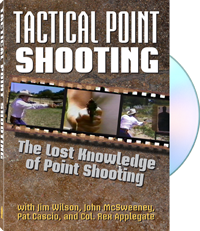 Tactical Point Shooting contains valuable shooting knowledge that has been either lost or underappreciated for years. The three techniques shown, explained, and practiced by Sheriff Jim Wilson, John McSweeney, and Pat Cascio in this video were valuable contributions to Col. Rex Applegate's instinctive point shooting technique. Each demonstrating his aptly named move, Wilson (The Punch), McSwseeney (The Swing), and Cascio (The Lift) show you three options for firing instantly when there is no time for aiming at the attacker. Tying it all together, Col. Rex Applegate shares his thoughts about instinctive point shooting, including why a gun owner must prepare for situations where an aiming stance is impossible or not the best choice. Don't miss your opportunity to learn this forgotten wisdom about point shooting from these four exceptional shooters. Tactical Point Shooting was extracted from the same archive that yielded Rex Applegate—The Lost Tapes . Viewers can thank Pat Cascio for safeguarding this invaluable historical footage. A well-known martial artist and gunman in his own right, Cascio helped document and preserve the contributions of Col. Rex Applegate through the videos he shot and edited through the years. For information purposes only.